Prince Alfonso learns about his origins and Makai Knights from Rafael Banderas, the man who rescued him from an attack by Horrors sent by Mendoza. Rafael is the Makai Knight Gaia, and a friend of the previous Garo. Rafael agrees to teach Alfonso the ways of the Makai Knights in order to protect the kingdom of Valiante from the Horrors and Mendoza. 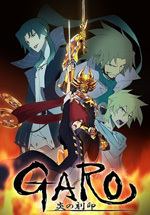 Garo: Honoo no Kokuin (Garo: The Carved Seal of Flames) is an anime series based on the Garo tokusatsu drama series. The first TV series aired in 2005-2006, with the most recent 4th series (Garo: Makai no Hana) airing earlier this year. There have also been TV spinoff series and movies based on the franchise. Familiarity with the TV series is not required for enjoying the anime, although those who have seen the TV series will enjoy seeing how its themes and tropes have been tweaked for the anime's setting in a fictitious country resembling Spain during the Spanish Inquisition. I'm glad I'm not the only person who's watching Garo this season. I know it doesn't have a famous animation studio backing it but I like the characters enough to follow. Oh and I'm fan of the gray mortality featured in the series so far because it never felt realistic how the heroes always went around enforcing their personal brand of JUSTICE on everyone they met. Even if the person has the best intentions at heart it's unlikely he/she could change society by simply the punishing evildoers in one episode and hope everyone learns a valuable lesson afterwards. Then again, I'm biased towards medieval settings and sword/magic themes in general. Both the TV show and the anime touch upon the internal conflicts experienced by Makai Knights and Makai Priests putting their lives on the line to protect humans who may not exactly be deserving of said protection, and who in the anime are actively hunting them down. Because of their close contact with Horrors and the Makai world, Makai Knights and Priests are always at risk of going over to the dark side. Mendoza appears to have done so already. I wonder if the preview for the next episode means Dark Makai Knight Kiba, a major antagonist in the Garo universe, will be making an appearance. I really like the father-son pairing of German and Luis. I think it cleverly echoes the Zero-Garo relationship of the first two TV series, where Zero/Rei and Garo/Kouga have a frenemies relationship. Zero the Silver Fanged Knight is the more worldly and cynical of the two, while Garo/Kouga is a straight arrow type who is initially rather humorless. In the anime we get unworldly teenager Luis, who from his perspective has the most embarrassing father in the world in German. Their bickering relationship feels very natural, mocking but affectionate German and easily flustered Luis. At first I had assumed German was supposed to be Zero, who had inexplicably been renamed Zoro in the anime, since both Zero and Zoro wear silver armor and wield two knives which can be joined together. But Zero is referred to as the Silver Fanged Knight, while Zoro is referred to as the Shadow Cutting Knight. So it appears Zero and Zoro are different Makai armor. Gaia is original to the anime. Eh, I've actually never heard of the franchise before I started watching the reboot. I just thought it was fun to watch a actual teen character act like someone in that age range vs miniature adults or something. Oh and it's rare to see a parent involved in a kid's life other than sometimes show up by the middle and/or end of the series. I know Luis is obviously not over his mother's death but at the same time I find it believable he's not as strong as we would assume for his skill level. Yes, he has potential yet right now he's just in immense pain/rage (understandable) and his father tries to help even though it might come across as being silly to his son. Are the Makai Priests=Makai Alchemists? I'm slightly confused in order to become a Makai Knight one needs the inherited armor right? So are the Alchemists just people with magical powers but no armors? Are there only a select number of armors? I'm not clear about how Makai Knights get armor when they don't inherit it, especially regarding the low-ranked unnamed armors. The named armors such as Garo or Zoro appear to be passed down by inheritance. In the TV drama series they can also be assigned to a Makai Knight when there is nobody of the bloodline to inherit, or the current armor wearer can assign it to say, an adopted son. Makai Priests = Makai Alchemists, perhaps they're using 'Makai Alchemists' in the anime subtitles because it's a more natural fit to the anime setting? In the TV drama series only males can become Makai Knights - women can only become Makai Priests, while men can choose to become Makai Knights or Makai Priests. The anime seems to be set at a time when things haven't become quite so codified, so who knows, maybe a female Makai Knight could show up. I didn't know people could assign the Makai armors which means technically Germán could give up his armor to anyone suitable, not necessarily a blood relative then. Is the Golden Knight strongest armor set out? I thought it could be since it is able to upgrade with the magic/cursed ring. Probably, the only priests mentioned in the show are related to the Church and somewhat evil/corrupt. The only part I thought was weird is how no one is allowed to hurt humans despite being hunted down in towns. Sure, but eventually won't everyone die then who will stop the Horrors? Although, I would like to see a female Makai Knight but it looks to be unlikely esp. since so far all the Knights have been men. I can't say much about the Alchemists since we've only been introduced to one. Garo is considered the strongest armor, but overall combat skills also depend on the strength and skills of the armor wearer. Check out this Garo-Zero fight where Zero gives Garo a run for his money. The timer running on one corner of the screen is because Makai Knights can only wear their armor for a maximum of 99.9 seconds. Go over that and your armor 'eats' you. We've seen one other alchemist, Gael, who repaired Zaruba. Zaruba is not just a magic ring, it's a familiar or companion who happens to reside in the ring. It can detect Horrors as well as provide information on Horrors they encounter. Now that I think about it I am surprised Germán doesn't also have one, it doesn't have to be a ring, by the way. Both Makai Priests and Makai Knights fight Horrors, they just have different skill sets. The Knights are more brawn, while Priests are more brains in the sense of using spells. Some Makai Priests actively fight Horrors themselves, while some focus on constructing magic tools or developing new spells, including healing magic. Haha, that's true I figured it was just his father trying to annoy Leon out of boredom. Thanks for the info about the different armor sets. It's somewhat odd to see a live action/drama of a anime series unless I'm totally familiar with it. The only one I completed is Blue Blazes but even that was based on a manga series. From the anime I assumed Zaruba would do a bit more other than help control the Golden Knight's flames because he apparently steals life from the user as payment. Will we ever find out why the ring was broken in the first place? Germán and other Makai Alchemists use a bell/charm to find Horrors, I guess. Although, I think it fits better w/the medieval setting vs modern times because I can imagine it working out even if everyone has mecha armors and long trench coats which technically appear to be out of place in the countryside. I rewatched the earlier episodes and I really love the Germán and León interactions. They feel very realistic, with León being all surly and annoyed by his dad always trying to get it on with the ladies and telling León he needs to get laid, and Germán egging on León further the more annoyed León gets. So Ema is looking for somebody called Luciano? And why is she mistrustful of Makai Knights? I don't trust Gulm the watchdog. She didn't seem to care too much about so many Makai Knights and Priests getting called, and blaming them for not recognizing false orders. I thought Ema is generally mistrustful of everyone due to the witch hunts and how unpredictable Makai Knights she met so far were. I thought she'd join their party as the 3rd member but I guess she does have own business to take of too. Is Gulm the white-haired girl in the white dress who speaks to Germán about his missions? She seems to be either extremely powerful or just indifferent to how humanity is acting. Yes, Gulm is the white-haired "girl" who is of indeterminate age. Hmmm, could this Luciano dude be Dark Knight Kiba? I'm wondering if they'll have to put some kind of time skip in the series, because Alfonso won't be able to handle Makai weapons overnight, and more so Makai armor. León has been trained all his life by his father, but he is still a work-in-progress. Alfonso is a complete newbie and I can't see him lifting a Makai sword after just a couple of weeks' training. The one thing Alfonso has going for him is that he has his own focused goal for becoming a Makai Knight. León feels more like he's doing this because his dad told him to, and he couldn't think of anything else to do anyway. So I guess what Grandpa Garo was trying to tell León, and Germán is trying to tell him by telling him he has to experience love etc., is that León has to find his own reason or motivation for being a Makai Knight. As episode 4 showed, simple revenge won't do. The key seems to be wanting to protect somebody - a specific person or in Alfonso's case, his countrymen in general - even at the cost of your own life, and León hasn't found that somebody yet. Although, the time-skip would be somewhat awkward since we wouldn't know what everyone would be doing while Alfonso is training other than traveling around. I'm going to predict he won't be 100% ready to fight but he will meet up with everyone sooner than later. It would interesting if Leon's complete motivation ends up being revenge, sure, it'd be very cynical and it's rare to see a show allow "revenge" as a primary reason (unless it's the villain). Mostly because there'd be nothing to do after he kills/defeats the person other than realize nothing has changed as it won't revive his late mother. Likewise, I do feel empathy for Leon as he'd probably be rather doing *anything* than fight Horrors but he's stuck w/the inherited Makai Knight armor set. My prediction for when Rafael and Alfonso and Germán and León meet up is that Rafael is gonna start out by beating the crap out of Germán, for failing to protect Anna, his good friend's daughter (also because in the TV dramas series when Makai Knights first meet each other it always seem to involve beating the crap out of each other). Then Alfonso will try to convince Germán and León to join his cause, and León will be all "Why should I, your dad had my mom burned at the stake." And finally León has the epiphany that he has to protect people, even people who personally piss him off, to truly be Garo the Golden Knight. This happens in the midst of battle when he's about to be consumed by the Garo armor or about to get killed - suddenly we see León in Zaruba-land, he has his epiphany, Grandpa Garo pats his shoulder, and Garo returns to the battle powered up. Maybe he'll even get a magic golden horse matching his armor, just like dad's magic silver horse.